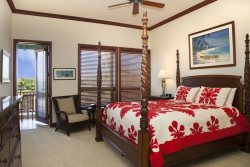 Welcome to Kulalani Resort Villa 904 ~ This 2 bedroom 2 and a half bath townhome recently completed construction in the Summer of 2016 and was professionally decorated to be released as a brand new vacation rental beginning December 2016! Bright and airy, this home pops with vibrance and color in every room. Enjoy three lanais, one just beyond the dining area, and one for each of the master suites. Each of the master suites is furnished with a king bed, and either room can be converted into two twin beds upon request. Both suites have their own private bathrooms with dual vanities, as well as tub and walk in shower. There are flat screen televisions in each bedroom as well as the living room. The living room invites warm sunlight through a beautiful wall of windows, onto a sea blue sectional of comfort. The gourmet kitchen is fully stocked to allow for those home cooked meals when dining out isnt desired. The barbecue grill provides a fun and casual option for a sizzling steak and seafood spread. The dining table seats four and can be extended to accomodate six. Barstools at the kitchen island are a fun spot to socialize with your chef. This home is fully air conditioned with ceiling fans in the bedrooms and dining room. The laundry room has a full size washer and dryer and the garage is available for guest parking convenience along with unmarked parking stalls nearby. The Kulalani Recreational Facility is an expansive park style setting with a large central pavilion between a lap pool and a lagoon pool. Exercise room is one of the most impressive in size and equipment for resorts in the area. Conveniently located near to the Shops at Mauna Lani Resort in the lovely Mauna Lani Resort, the Mauna Lani North and South Golf Courses, white and balck sand beaches and fine dining. Snorkel and sunset sails, whale watch, shopping and suntanning all await you whe you stay at Kulalani 904. This vacation home is also stocked with beach gear including snorkels, boogie boards, beach chairs and a cooler, and is ready to provide a welcoming spacious tropical home for your Big Island Vacation.